How Should You Check for Those Annoying Bed Bugs? A bed bug infestation is a massive headache for homeowners, especially when it is in its later stages. Because then, you’re forced to pay good money to call someone from pest control to get rid of these pests. If, however, you suspect you have an infestation that is in its early stages, then it’s best for you to check for bed bugs by yourself and get rid of them early. Treating a minor infestation is way easier and friendlier on your pocket than treating a full blown infestation. Do keep in mind that bed bug bites are not the best indicator of an infestation. Why? That’s because depending on the bugs, the size and appearance of the bites can vary, sometimes looking like mosquito bites while at other times looking like rashes. Believe it or not, some people have shown to not react in the slightest to bug bites, which would mean you have to be on guard regarding an infestation. And before you do anything, make sure you’re wearing a pair of disposable gloves. Bed bugs will infest any and every place where humans can survive and thrive. Most bed bugs can travel up to 20 feet from their nest in order to feed on humans. Bed bugs are night creatures. Even so, if hunger strikes, they do not hesitate to move during the day. And if you find nothing in the piping, then just remove the mattress and carry on inspecting every inch of it. Needless to say, one person is more likely to miss an infestation when working alone, so it’s best to have a fresh set of eyes beside you. This way they can point out places that you may have missed. 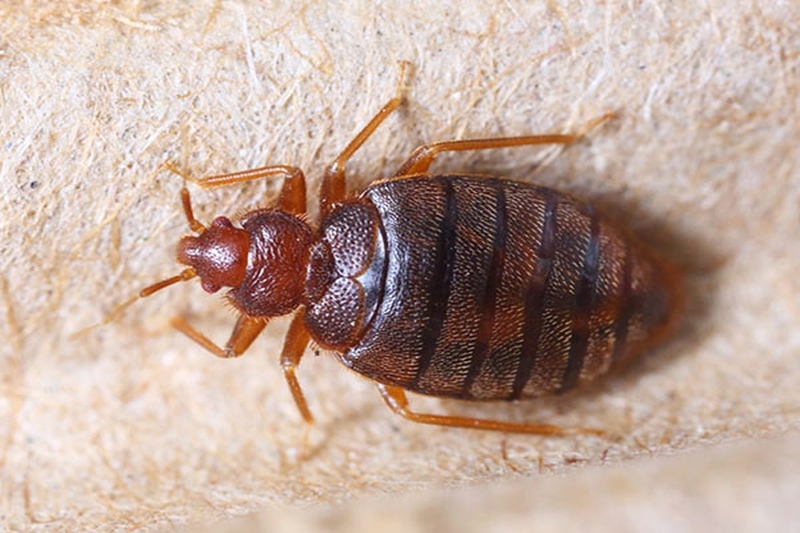 In case your manual check didn’t show up any conclusive evidence, then keep an eye out for the following sure shot ways on how to check for bed bugs. Eggshells or even eggs which are very small, around 1 millimeter. Molted skin, which is pale yellow in color. Rust colored stains on curtains, mattresses or sheets. This is actually the color of the dried blood of bugs that were crushed by you or other heavy objects placed on them. Black or dark brown colored tiny spots which you may mistake as dirt are actually bug excrement. Get rid of movable infested objects. If they are small enough, keep them in a sealed plastic bag, and throw them in your trash can. If these items can be washed, dip them all in scalding hot water. Let them sit there for half an hour or so, and dry them on the highest dryer setting. If the infested objects are too big for a plastic bag, then cover them with shrink wrap or a tightly woven, zippered cover, and leave them in your garage or attic, where they will remain so till the bugs die. Or you can simply go out and burn them. For items like furniture, your first option should be to get rid of the infestation. If that is not an option, then throw them away and completely destroy their appearance so that nobody else is tempted to pick them up. You can even use a marker or spray paint and write “BED BUGS” on it to warn people. To clean mattress seams, use a stiff brush to scrub off the bed bugs. Do this outside. If you’re doing this inside, immediately vacuum your floor so that your cleaner can pick up all the bugs. When you’re done with the vacuuming, take out its cleaner bag, put it inside a plastic bag and throw it in your trash can. It is generally advised to simply buy a new mattress in case your existing one is infested. This is simply because purchasing a new one is a lot less hassle than getting rid of the bugs in your infested mattress. If some items are small enough to fit inside a freezer, then ziplock them and put them inside. Just make sure of two things – the temperature of your freezer is lower than 46°F (use a thermometer) and that your items stay inside the freezer for at least 5 days. When it comes to how to check for bed bugs and get rid of them, you should never miss those interception devices. These are economical devices that help you trap bed bugs when they are traveling away from their nest in order to feed.